Ricoh Japan has announced a new app called THETA+ for iOS and Android. 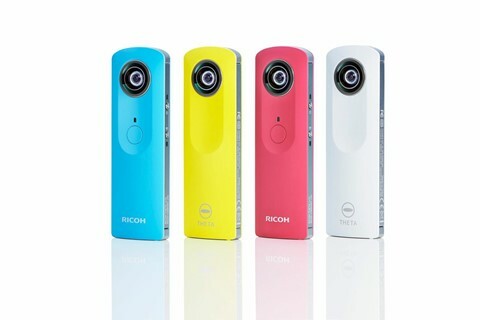 With THETA+, owners of Ricoh’s THETA spherical camera can edit images shot with the device via a smartphone or tablet. Due to be released ‘soon,’ the�new app is designed to work in tandem with the existing THETA app, which enables shooting and sharing from a smartphone. THETA+�includes options to trim photos, change their color tone and switch�projection format.�In addition, Ricoh will be expanding the THETA accessory lineup and releasing firmware version 1.30 for the THETA M15 camera. The new THETA+ app will add�spherical image formats like ‘little planet’ as well as�five color tone filters and an option for creating time-lapse videos. The iOS version will be available for devices running iOS 8 and later, while the Android version will require Android 4.4 or later. In addition to the new app, Ricoh has announced that it will also be launching a TH-1 Hard Case for the THETA. The case has an IPX7 rating for water resistance and is made of clear polycarbonate material. There will also be a new TS-1 Soft Case made of synthetic leather for storage and modest protection; black and white versions will be available. Pricing has not yet been revealed. Finally, Ricoh says that ‘soon’ it will be releasing firmware version 1.30 for the THETA M15 camera. The new firmware will increase maximum video clip recording time to 5 minutes from 3 minutes, and a total recording time of about 60 minutes rather than the current�40 minute limitation. Once the firmware is released, camera owners will be able to�update using the Ricoh THETA Windows and Mac applications. Expanded product line includes new RICOH THETA accessories such as a water resistant case and increased app functionality! TOKYO, July 7, 2015�Ricoh Company, Ltd. and Ricoh Imaging Company, Ltd. are planning to release the “THETA+” app, which is specially designed for editing images shot using the RICOH THETA spherical image camera. The new application will be available for download soon. This specialized app enables users to trim and edit or change settings such as the projection format and color tone settings of spherical images shot using RICOH THETA easily on their smartphone. Edited images can be shared easily by posting to social networks such as Instagram or Facebook. Two new accessories, a water resistant case and handy portable soft case will also be available. Additionally, a new firmware version (version 1.30) will be released which increases the 360 degree video recording time for the RICOH THETA (m15) from the current 3 minutes to a maximum of 5 minutes. Spherical images can be trimmed to the desired shape. The projection format of spherical images can be selected. New spherical images formats which were not conventionally available in the RICOH THETA app, such as the “little planet” format in which shot images are reproduced as a small planet shapes floating in space, are now available. Select one of 5 types of filter to change the color tone of the spherical image. Images can be posted to external apps such as Instagram or Facebook. Time-lapse videos in which multiple spherical images are taken at fixed intervals and then combined into a movie file can now be created. Created time-lapse videos can be viewed as spherical videos in the RICOH THETA app. The new app links with the previous RICOH THETA for iPhone or RICOH THETA for AndroidTM app to enable editing of images immediately after shooting. *Operation is not guaranteed on all devices. – Hard case that has IPX7 equivalent waterproofing, perfect for shooting outdoors near water. *The camera cannot take photos under water. Images can only be shot by remote operation from a smartphone. – Equipped with a tripod screw for attachment of a wide variety of camera accessories. – Designed to be small and light just like your RICOH THETA , and easy to carry around. Made of�synthetic leather and available in two color variations, black or white. -The total recording time on the RICOH THETA (m15) is increased to approximately 60 minutes�from the conventional 40 minutes. Version update method: Firmware can be updated using either of the “RICOH THETA for�Windows�” or “RICOH THETA for Mac” computer applications.